September 21, 2017 by Anthony Palombo, D.C. This article reveals new data that indicates our vegetables and fruits, herbs and grasses, are increasingly becoming more and more nutrient deficient due to increased CO2 levels in our planet’s atmosphere. This re-emphasizes the dire need for wholefood supplementation in our diet. It is becoming increasingly necessary, if we wish to live long and healthy lives, that we take daily dosages of wholefood nutrients, such as those grown and produced by Standard Process Labs at their huge organic farm up in Palmyra, Wisconsin. Take a few minutes to enjoy the award-winning documentary vimeo at this site and learn more about the production of wholefood supplements. Now for the breaking news story about . . .
Irakli Loladze is a mathematician by training, but he was in a biology lab when he encountered the puzzle that would change his life. It was in 1998, and Loladze was studying for his Ph.D. at Arizona State University. Against a backdrop of glass containers glowing with bright green algae, a biologist told Loladze and a half-dozen other graduate students that scientists had discovered something mysterious about zooplankton. Loladze used his math training to help measure and explain the algae-zooplankton. He and his colleagues devised a model that the relationship between a food source and a grazer that depends on the food. They published that first paper in 2000. But Loladze was also captivated by a much larger question raised by the experiment: Just how far this problem might extend.“What struck me is that its application is wider,” Loladze recalled in an interview. Could the same problem affect grass and cows? What about rice and people? “It was kind of a watershed moment for me when I started thinking about human nutrition,” he said. In the outside world, the problem isn’t that plants are suddenly getting more light: It’s that for years, they’ve been getting more carbon dioxide. Plants rely on both light and carbon dioxide to grow. If shining more light results in faster-growing, less nutritious algae—junk-food algae whose ratio of sugar to nutrients was out of whack—then it seemed logical to assume that ramping up carbon dioxide might do the same. And it could also be playing out in plants all over the planet. What might that mean for the plants that people eat? He published those findings just a few years ago, adding to the concerns of a small but increasingly worried group of researchers who are raising unsettling questions about the future of our food supply. Could carbon dioxide have an effect on human health we haven’t accounted for yet? The answer appears to be yes—and along the way, it has steered Loladze and other scientists, directly into some of the thorniest questions in their profession, including just how hard it is to do research in a field that doesn’t quite exist yet. IN AGRICULTURAL RESEARCH, it’s been understood for some time that many of our most important foods have been getting less nutritious. Measurements of fruits and vegetables show that their minerals, vitamin and protein content has measurably dropped over the past 50 to 70 years. Researchers have generally assumed the reason is fairly straightforward: We’ve been breeding and choosing crops for higher yields, rather than nutrition, and higher-yielding crops—whether broccoli, tomatoes, or wheat—tend to be less nutrient-packed.In 2004, a landmark study of fruits and vegetables found that everything from protein to calcium, iron and vitamin C had declined significantly across most garden crops since 1950. The researchers concluded this could mostly be explained by the varieties we were choosing to grow.Loladze and a handful of other scientists have come to suspect that’s not the whole story and that the atmosphere itself may be changing the food we eat. Plants need carbon dioxide to live like humans need oxygen. And in the increasingly polarized debate about climate science, one thing that isn’t up for debate is that the level of CO2 in the atmosphere is rising. Before the industrial revolution, the earth’s atmosphere had about 280 parts per million of carbon dioxide. Last year, the planet crossed over the 400 parts per million threshold; scientists predict we will likely reach 550 parts per million within the next half-century—essentially twice the amount that was in the air when Americans started farming with tractors.If you’re someone who thinks about plant growth, this seems like a good thing. It has also been useful ammunition for politicians looking for reasons to worry less about the implications of climate change. Rep. Lamar Smith, a Republican who chairs the House Committee on Science, recently argued that people shouldn’t be so worried about rising CO2 levels because it’s good for plants, and what’s good for plants is good for us. But as the zooplankton experiment showed, greater volume and better quality might not go hand-in-hand. In fact, they might be inversely linked. As best scientists can tell, this is what happens: Rising CO2 revs up photosynthesis, the process that helps plants transform sunlight to food. This makes plants grow, but it also leads them to pack in more carbohydrates like glucose at the expense of other nutrients that we depend on, like protein, iron and zinc. Loladze’s paper was first to tie the impact of CO2 on plant quality to human nutrition. But he also raised more questions than he answered, arguing that there were fundamental holes in the research. If these nutritional shifts were happening up and down the food chain, the phenomenon needed to be measured and understood. For the rest of the story about how difficult it was for Loladze to find funding for such research and study — politics, of course, being the complicating factor — click on the link below. 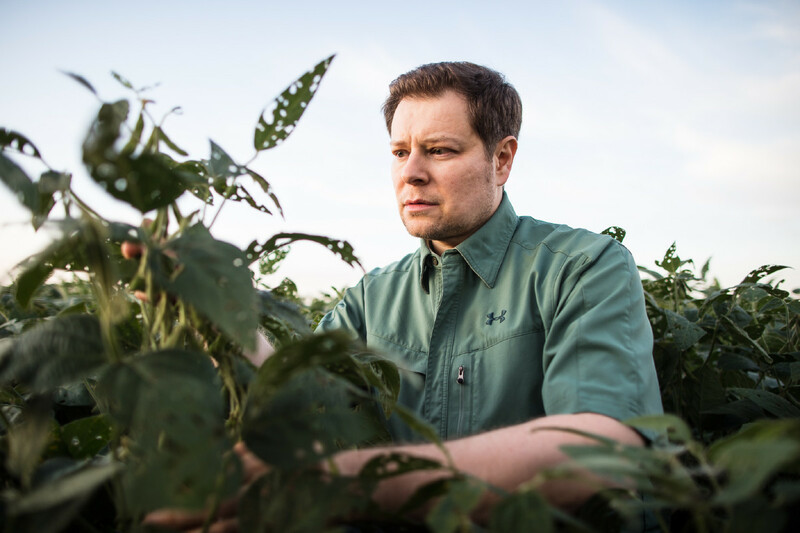 In 2014, Myers and a team of other scientists published a large, data-rich study in the journal Nature that looked at key crops grown at several sites in Japan, Australia and the United States that also found rising CO2 led to a drop in protein, iron and zinc. It was the first time the issue had attracted any real media attention. The same year―in fact, on the same day―Loladze, then teaching math at the The Catholic University of Daegu in South Korea, published his own paper, the result of more than 15 years of gathering data on the same subject. It was the largest study in the world on rising CO2 and its impact on plant nutrients. Loladze likes to describe plant science as ““noisy”―research-speak for cluttered with complicating data, through which it can be difficult to detect the signal you’re looking for. His new data set was finally big enough to see the signal through the noise, to detect the “hidden shift,” as he put it. What he found is that his 2002 theory—or, rather, the strong suspicion he had articulated back then—appeared to be borne out. Across nearly 130 varieties of plants and more than 15,000 samples collected from experiments over the past three decades, the overall concentration of minerals like calcium, magnesium, potassium, zinc and iron had dropped by 8 percent on average. The ratio of carbohydrates to minerals was going up. The plants, like the algae, were becoming junk food. What that means for humans―whose main food intake is plants―is only just starting to be investigated. Researchers who dive into it will have to surmount obstacles like its low profile and slow pace, and a political environment where the word “climate” is enough to derail a funding conversation. It will also require entirely new bridges to be built in the world of science―a problem that Loladze himself wryly acknowledges in his own research. When his paper was finally published in 2014, Loladze listed his grant rejections in the acknowledgements. I think you will agree that this study is crucial to the health of humanity. Thank you for staying with the lengthy article — and for visiting Standard Process’s website. Until my next post, here’s to your health and healing. Visit my HealingTones.org blog for inspired and inspiring articles.